I’m not quite sure what’s malicious about a Mythweb interface, but hey, who am I to argue with the sensible people in university ITS. This entry was posted on Wednesday, August 5th, 2009 at 15:51	and is filed under WTF University. You can follow any responses to this entry through the RSS 2.0 feed. Both comments and pings are currently closed. You could try running SSH or OpenVPN on TCP port 443 at home, and that should allow you to get through their HTTP proxies (provided it’s only a URL-based or port 80-only block). OpenVPN has built-in support for HTTP proxies (use the http-proxy option in your configuration). SSH is a little tricker, as it doesn’t have built-in support. 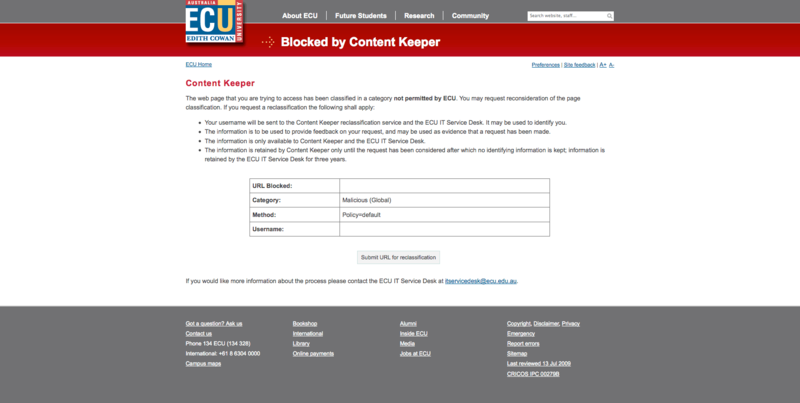 If your university uses HTTP proxies, then Corkscrew is your answer. If it uses SOCKS proxies, then you can use tsocks, which is a little easier than Corkscrew. Sadly, I’ve had the outbound 22 argument before with ITS. I lost, obviously. Historically, I’ve used GNU httptunnel to get a SSH connection out, but I might check out Corkscrew as well. Cheers for the tip.